Cancer is a primary cause of human fatality and conventional cancer therapies, e.g., chemotherapy, are often associated with adverse side-effects, tumor drug-resistance, and recurrence. Molecularly targeted therapy, composed of small-molecule inhibitors and immunotherapy (e.g., monoclonal antibody and cancer vaccines), is a less harmful alternative being more effective against cancer cells whilst preserving healthy tissues. Drug-resistance, however, caused by negative regulation of cell death signaling pathways, is still a challenge. Circumvention of negative regulators of cell death pathways or development of predictive and response biomarkers is, therefore, quintessential. This review critically discusses the current state of knowledge on targeting negative regulators of cell death signaling pathways including apoptosis, ferroptosis, necroptosis, autophagy, and anoikis and evaluates the recent advances in clinical and preclinical research on biomarkers of negative regulators. It aims to provide a comprehensive platform for designing efficacious polytherapies including novel agents for restoring cell death signaling pathways or targeting alternative resistance pathways to improve the chances for antitumor responses. Overall, it is concluded that nonapoptotic cell death pathways are a potential research arena for drug discovery, development of novel biomarkers and targeted therapies. The online version of this article ( https://doi.org/10.1007/s10495-018-1440-4) contains supplementary material, which is available to authorized users. Cancer is a primary cause of human fatality with a global economic toll of approximately US$1.4 trillion per annum. It is estimated that ~ 12 million people will annually die of cancer by 2030 . Conventional cancer therapies, e.g., chemotherapy or radiotherapy, usually interrupt vital cellular events such as DNA replication and microtubule assembly in all living cells and are often associated with adverse side-effects, tumor drug-resistance, and recurrence . The prime challenge in conventional therapies is that malignant tissues acquire adaptive phenotypes rapidly and consequently evolve drug-resistance through somatic evolution . Amongst other mechanisms, a dominant path for development of drug-resistance is inhibition of cell death signaling pathways , e.g., apoptosis, ferroptosis, necroptosis, autophagy, and anoikis, which are initially crucial for tissue development and homeostasis. De-regulation of cell death principally leads to pathological disorders like cancer where inhibition of cell death promotes carcinogenesis, and tumor progression , i.e., the induction of negative regulators suppresses cell death mechanisms during oncogenesis. For example, resistance to apoptosis has been known as the hallmark of cancer which is important during tumorigenesis as well as in the development of drug-resistance . Thus, to overcome cancer drug-resistance, it is critical to deactivate the negative regulators of cell death pathways, to obtain predictive response biomarkers, and to develop “companion diagnostics” [2, 7]. Unlike conventional therapies, “molecularly targeted therapy”  is the application of substances that mechanistically block or interfere with specific molecules which are involved in cancer-related signaling pathways, thus, causing less harm to healthy cells. Targeted therapies are composed of small-molecule inhibitors (SMIs) and immunotherapy (e.g., monoclonal antibody) (Supplementary Video 1) . The objectives of this review are: (i) to critically evaluate knowledge on the mechanism of targeting the negative regulators of cell death signaling pathways; (ii) to discuss recent advances in clinical and preclinical research on biomarkers of negative regulators to improve clinical outcomes for precise diagnosis and effective cancer therapy. This may help develop a better combination of therapeutics including novel agents restoring cell death signaling pathways or targeting alternative resistance pathways to improve the chances for antitumor responses in clinical trials. In addition, potential negative regulators for targeted therapy and biomarkers have been enlisted in this review but, as research is currently nascent, rigorous discussion would be premature at present. Apoptosis is the most investigated mechanism of cell death , which plays a crucial role in intrinsic tumor suppression. 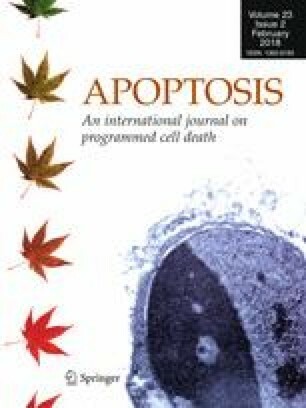 Defective apoptosis, therefore, represents a primary contributing factor in the development and progression of cancer and plays a remarkable part in resistance of tumor cells to conventional therapies [6, 9]. Typical morphological features of apoptosis include shrinkage of the cell, chromatin condensation, DNA fragmentation, mitochondrial membrane potential (ΔΨm) dissipation and blebbing of the plasma membrane . Cysteine aspartate-specific proteases (caspases) are a distinctive characteristic of apoptosis, as they serve as initiators and executioners of the apoptotic signaling cascade [8, 10]. To date, two principal mechanisms for apoptosis have been proposed, i.e., intrinsic and extrinsic. The intrinsic pathway is mediated by changes in mitochondrial permeability which subsequently leads to dissipation of Δψm, mitochondrial swelling, rupture of the outer mitochondrial membrane and the release of cytochrome-c, “apoptosis-inducing factor” (AIF), “second mitochondria-derived activator of caspase” (Smac), also known as “direct IAP-binding protein with low isoelectric point (pI)” (DIABLO), into the cytosol. The cytoplasmic release of cytochrome-c activates caspase-3 via the formation of a complex known as apoptosome. Alternatively, Smac/DIABLO promotes caspase activation by binding to “inhibitor of apoptosis proteins” (IAPs). The intrinsic pathway is tightly regulated by the B-cell lymphoma 2 (Bcl-2) family proteins (Fig. 1) [8, 9]. Additionally, intrinsic apoptosis is stimulated by cytokines like interferons (IFNs) through activation of interferon receptors (IFN-Rs) ; however, induction of Fas-mediated apoptosis by interferons also has repeatedly been reported . Subsequently, a group of genes, called “IFN stimulated genes” (ISGs) are activated, leading to upregulation of “IFN regulatory factors” (IRFs) (Fig. 1). Interferon induced-apoptosis is the cause of cell death in many cancers, e.g., ovarian, colorectal, and bladder cancers [11, 13]. The extrinsic pathway involves direct activation of caspase cascades through “death receptors” (DRs) on the cell surface . The DRs are a subset of receptors of the “tumor necrosis factor” (TNF) superfamily, characterized by a cytoplasmic region also known as the “death domain,” which is essential for cell death induction. The best-known DRs include “TNF-receptor-1” (TNF-R1/p55/CD120a), “TNF-related apoptosis-inducing ligand-receptor-1” (TRAIL-R1/DR4), “TNF-related apoptosis-inducing ligand-receptor-2” (TRAIL-R2/DR5/APO-2/KILLER), and Fas (CD95/APO-1) . The most common death ligands are TNF, Fas ligand (FasL) and TRAIL (syn. Apo2L) . In Fas and TRAIL-Rs, upon binding of the ligand to the receptor, receptor aggregation occurs, facilitating the recruitment of adapter proteins like “Fas-associated death domain” (FADD), and procaspase-8 (Fig. 1), leading to the formation of the “death-inducing signaling complex” (DISC). Subsequently, procaspase-8 is converted to activated caspase-8 which initiates apoptosis by cleaving other downstream or executioner caspases, e.g., caspase-3, -7 (Fig. 1) . In contrast, “TNF receptor-associated death domain” (TRADD) plays a key role in the formation of the TNF-R1 signaling complex . Subsequently, complex IIa or IIb are formed to execute either apoptosis or necroptosis, respectively (Fig. 1). Likewise, DRs have pleiotropic signaling properties and engage in nonapoptotic activities such as regulation of cell proliferation and differentiation, inflammatory responses, chemokine production, and tumor-promoting activities which potentially cause a hurdle in targeted therapy. For example, while TRAIL can selectively induce death in tumorous cells , it also activates nonapoptotic signaling pathways, such as “nuclear factor-κB” (NF-κB), “mitogen-activated kinases” (MAPKs), in cancer cells . Nevertheless, TRAIL and agonistic TRAIL-R-specific antibodies are currently in clinical development for cancer-targeted therapy ; likewise, a first-in-class small molecule TRAIL inducer, imipridone ONC201 was well-tolerated in phase II clinical trial for advanced refractory solid tumors . In contrast to the canonical role of apoptosis against cancer cells, accumulating evidence shows that some factors in the process of apoptosis can also promote carcinogenesis and tumor progression. For example, Fas promotes tumorigenesis , and TRAIL-R can exacerbate metastasis through accumulating tumor-supportive immune cells in the cancer microenvironment . Tumor cells evolved to escape apoptotic cell death . Negative regulation of apoptosis inhibits cell death signaling pathways. Several families of proteins act as negative regulators categorized into either antiapoptotic factors, e.g., IAPs and Bcl-2 proteins or prosurvival factors like “cellular FLICE-like inhibitory protein” (cFLIP) and NF-κB (Fig. 1) (Table 1) [8, 9, 22, 23]. The IAP family are a group of evolutionary conserved endogenous caspase inhibitors, e.g., X-linked IAP (XIAP), cellular IAP1 (cIAP1), cellular IAP2 (cIAP2), survivin and livin (Fig. 1). IAPs can block caspase activation or inhibit active caspase-3 and -7 . Furthermore, IAPs may act in a caspase-independent manner by regulating cell survival signaling pathways such as NF-κB through ubiquitination . Inhibition of apoptosis by IAPs in response to chemotherapy has been proposed to be a cause of drug-resistance, e.g., apoptosis was suppressed by XIAP, cIAP1 or cIAP2 (Fig. 1) following in vitro treatment with cisplatin, cytarabine, and staurosporine . XIAP, the most potent negative regulator of the IAPs family, can directly bind to and deactivate caspases-9 and -3 . XIAP is overexpressed in some cancers like non-small cell lung carcinomas (NSCLC), and effectively inhibits intrinsic and extrinsic pathways of apoptosis . Therapeutics such as antisense strategies and short-interfering RNA (siRNA) molecules have been demonstrated to sensitize hepatoma cells to chemotherapeutic agents by inhibiting XIAP or survivin in vitro. SM-164 (a non-peptidic IAP inhibitor) was also shown to enhance TRAIL-induced cell death by concurrently targeting XIAP and cIAP1 . cIAP1/2 regulate caspase activity indirectly via ubiquitination of “TNF receptor-associated factors” (TRAFs) which, subsequently, inhibit TNF-R1- and TRAIL-induced cell death (Fig. 1). Naturally, cytosolic Smac/DIABLO deactivates IAPs by blocking its inhibitory function . Smac-mimetic compounds have been shown to inhibit cIAP1/2, through ubiquitination, sensitizing cancer cells to TRAIL-induced apoptotic death . It has also been reported that Smac-mimetics increase cancer cell response to chemotherapeutics by enhancing autocrine TNFα feedback loop . Livin, (syn. melanoma IAP/ML-IAP), apart from inhibiting executioner caspases (Fig. 1), promotes ubiquitin-proteasome-mediated degradation of Smac/DIABLO. It is overexpressed in tumors like colon and bladder cancers, renal cell carcinoma (RCC), neuroblastoma, and glioma. A novel small-molecule Smac-mimetic antagonist of IAPs (peptide-mimetic compound), with a particular selectivity for livin, successfully induced apoptotic cell death in breast, ovarian and prostate cancer cell lines . Survivin, along with the mitotic spindle apparatus, regulates cell division during the G2/M phase of the cell cycle, and, similar to other members of IAPs, deactivates caspases, leading to inhibition of apoptosis (Fig. 1). Survivin has been used extensively as a model for molecular targeted therapy because it is overexpressed in cancerous cells while it is rarely detectable in the normal differentiated tissues. It is, however, a multifunctional protein at the crossroads of cell death, metabolism, and mitochondrial respiration, making it complicated to target . Transfection of antisense oligonucleotides targeting survivin mRNA was shown to sensitize malignant melanoma, head and neck squamous carcinoma, and medullary thyroid carcinoma cells to chemotherapy and successfully induced apoptosis (Table 1). Additionally, siRNAs were shown to downregulate survivin and diminish drug- and radio-resistance in NSCLC, lung adenocarcinoma, ovarian and pancreatic cancer cells . As an alternative approach to targeted therapy, use of glycolysis inhibitors has been reported to overcome the antiapoptotic function of survivin in neuroblastomas through targeting survivin-induced aerobic glycolysis (the Warburg effect) . Survivin was also the center of attention for cancer immunotherapy in the recent decade (see section “Immunotherapy”). The Bcl-2 family members regulate the intrinsic apoptosis pathway positively through (i) proapoptotic effectors (e.g., Bax, Bak, and Bok) and (ii) proapoptotic inducers, Bcl-2 homologous-3 (BH3) proteins (e.g., Bid, Bim, Puma, and Noxa), or negatively through (iii) antiapoptotic factors (e.g., Bcl-2, Bcl-xL, and Mcl-1) (Fig. 1). The balance of pro- versus antiapoptotic Bcl-2 family members tightly regulates the intrinsic apoptosis pathway, i.e., the executioners of the mitochondrial apoptosis pathway, e.g., Bak and Bax, are restrained by antiapoptotic factors. Disruption of balance by overexpression of antiapoptotic members or loss of expression of proapoptotic members of the Bcl-2 family in cancer cells causes drug-resistance [5, 15]. Navitoclax (ABT-263) is a BH3 small-molecule mimetic, efficiently binds to Bcl-2, Bcl-xL, and Bcl-W with antitumor activity against lymphoma, leukemia and myeloma cells [31, 32]. In phase I clinical trials, application of navitoclax is dose-limited because platelets are dependent on Bcl-xL for their survival, which reduces the usage of navitoclax especially in leukemia [31, 32]. Furthermore, a phase II clinical trial showed limited single-agent navitoclax activity against small-cell lung cancer . Venetoclax (ABT-199), an improved version of navitoclax, is not targeting Bcl-xL but binding to Bcl-2 specifically. Venetoclax represents the first-in-class, selective, oral Bcl-2 inhibitor-sparing platelets with antitumor activity against different types of lymphomas and leukemia. The US Food and Drug Administration (FDA) approved venetoclax (Venclexta™) for the treatment of chronic lymphocytic leukemia in 2016 . Advanced clinical trials suggested that venetoclax is effective in either monotherapy or polytherapy against a broad spectrum of hematological malignancies . Furthermore, venetoclax, due to its less toxic side-effects in combinational strategies, could replace navitoclax (Table 2) . Obatoclax, a BH3 mimetic, inhibits antiapoptotic members of the Bcl-2 family, inducing Bax/Bak-dependent apoptosis. It is noteworthy that obatoclax is differentiated from ABT-737 and navitoclax by its inhibitory action on Mcl-1, accordingly allowing obatoclax to overcome Mcl-1-mediated ABT-737 resistance, inducing apoptosis in hematological cancers and solid tumors . A phase II clinical trial with single-agent obatoclax was well-tolerated but no objective response observed in Hodgkin lymphoma . From a clinical point of view, antiapoptotic Bcl-2 family members are overexpressed, and downstream transcription modulators like NF-κB are highly active in many types of cancers, proposing them as potential targets for drug development. In fact, inhibitors of the Bcl-2 family proteins are effective in restoring apoptosis in cancer cells, but prolonged application may induce resistance . These insights suggest that drug-resistant cancer cells can be effectively treated by polytherapy, using one therapeutic to sensitize the cells through altered expression or regulation of cell death pathway molecules, in combination with another cytotoxic therapeutic to kill the now vulnerable cells . For instance, preclinical polytherapy with navitoclax and GX15-070, a pan-Bcl-2 inhibitor, overcame apoptotic resistance in established glioblastoma cells (Table 2) . Overall, in the era of precision medicine, developing polytherapy strategies will require improving the clinical efficacy of navitoclax and venetoclax. For example, Yamauchi et al. showed that combining navitoclax with anthracyclines (e.g., doxorubicin) or with cyclin-dependent kinase-9 inhibitors (e.g., dinaciclib) can potently induce apoptosis in small-cell lung cancer cells regardless of their dependency on anti-apoptotic Bcl-2 members for survival . Bcl-2 19 kilodalton interacting protein-3 (BNIP3), is a proapoptotic BH3-only member of the Bcl-2 family. However, in a majority of glioblastoma, nuclear BNIP3 acted as an antiapoptotic protein by binding to the promoter of the AIF gene thus repressing its expression and suppressing apoptosis . NF-κB, a master regulator of transcription, influences the expression of over 200 genes. Its overexpression has been linked to malignant transformation, cell survival, tumor progression, angiogenesis, metastasis, and drug-resistance , in hepatocellular carcinoma (HCC), colorectal, breast and prostate cancers, head and neck squamous cell carcinoma, leukemias, lymphomas and multiple myeloma [40, 41]. NF-κB inhibits the release of cytochrome-c and blocks caspase-3 activation, potently suppressing apoptosis. Most anticancer therapeutics can simultaneously activate NF-κB and the Bcl-2 family proteins in various cancer cell lines, thus causing further complication in cancer therapy . Moreover, IAPs, e.g., cIAP1, cIAP2, and XIAP are regulated by NF-κB which ultimately enhances cell survival in a positive feedback loop . To date, FDA has approved NF-κB inhibitors, such as thalidomide (Immunoprin™) for treatment of multiple myeloma and arsenic trioxide (Trisenox™) for acute promyelocytic leukemia [40, 41, 42]. It has also been shown, in phase I clinical trial; curcumin decreases levels of NF-κB in peripheral blood mononuclear cells . Recently, novel selective inhibitors of NF-κB including, IT-901 , PBS-1086  and DHMEQ  have been developed, with promising preclinical results, suggesting a need for clinical assessment of these drugs. For example, IT901 effectively induces apoptotic cell death in chronic lymphocytic leukemia cells through blocking NF-κB transcriptional activity . Nevertheless, available NF-κB inhibitors are typical of limited therapeutic efficacy when applied alone but can be improved in polytherapy (see section “Negative regulators of apoptosis”) [40, 47]. Nonetheless, prolonged NF-κB inhibition can be detrimental due to the vital role of NF-κB in innate immunity. Thus, treatment should be transient and reversible to circumvent long-term immunosuppression . Overall, due to the multifunctionality of NF-κB, care must be exercised to identify the most functional pathway to minimise off-target side-effects and toxicities . cFLIP is a crucial negative regulator of the apoptotic pathway and plays a role in resistance to apoptosis induced by DRs and conventional chemotherapy . cFLIP also participates in other cell death signaling pathways (see sections “Necroptosis” and “Autophagy”). Structurally, three splice variants of cFLIP are expressed: cFLIP-long (cFLIPL), cFLIP-short (cFLIPS) and cFLIP-Raji (cFLIPR), which all contain two N-terminal “death-effector domains” (DEDs), homologous to the two DEDs of caspases-8 and -10. cFLIPS and cFLIPR contain a short but slightly different, C-terminal domain, while, cFLIPL contains an extended C-terminal domain, similar to that of caspase-8, which is catalytically inactive. Both cFLIPS and cFLIPR compete with caspase-8 and caspase-10 for binding to FADD, consequently interfering with the formation of the DISC and inhibiting apoptosis . In contrast, the role of cFLIPL in regulating apoptosis is more versatile, i.e., cFLIPL behaves like cFLIPS, in an antiapoptotic manner, when expressed at high levels, but if expressed at lower levels, it can induce apoptosis by enhancing procaspase-8 recruitment to the DISC . Recently, Hughes et al. demonstrated that activation of procaspase-8 is regulated by the ratio of unbound cFLIPL/S to procaspase-8, i.e., procaspase-8:cFLIPL promotes DED-mediated procaspase-8 oligomer assembly, while procaspase-8:cFLIPS blocks activation of procaspase-8 . There is a strong correlation between the overexpression of cFLIP and resistance to FasL- or TRAIL-induced apoptosis, and many preclinical studies have demonstrated that inhibiting cFLIP directly or indirectly can overcome this resistance . For instance, cFLIP inhibits TRAIL-independent, DR- and caspase 8-dependent apoptosis in response to chemotherapy (5-fluorouracil, oxaliplatin, and irinotecan) in colorectal cancer cells . Thus, cFLIP is a promising target in DR-induced cell death for targeted therapy . However, cFLIP is regulated through different pathways, and the existence of the three variants adds another level of complexity for targeting cFLIP . Additionally, cFLIP is enzymatically inactive, and structurally similar to caspase-8, as a result targeting cFLIP is technically arduous and has thus far not been achieved . To date, many anticancer agents have been investigated for anti-cFLIP activity (Table 1). For example, cisplatin induces ubiquitylation and degradation of cFLIP; oxaliplatin, 5-fluorouracil, protein synthesis inhibitors (e.g., cycloheximide and anisomycin) and actinomycin-D downregulate cFLIPS/L; Trichostatin A downregulates cFLIPL; ITF2357 and valproic acid decrease cFLIP mRNA and protein levels . Most cFLIP inhibitors target cFLIPL and cFLIPS isoforms simultaneously, while some compounds affect only one isoform; for instance, bortezomib downregulates cFLIPL and upregulates cFLIPS, but nevertheless, sensitizes cells to DR-induced apoptosis. Overall, preclinical data show that selective inhibitors of cFLIP, in combination with a ligand such as TRAIL or FasL, or a chemotherapeutic agent like 5-fluorouracil, could be an effective targeted polytherapy. Nonetheless, selective inhibition of cFLIP isoforms may be more complicated requiring a deeper insight into the regulation and the role of the different isoforms for the rational design of selective cFLIP inhibitors . FADD is a critical adaptor protein of the DRs’ apoptotic signaling pathway particularly for Fas and TRAIL-Rs (Fig. 1). It initiates formation of DISC and serves as a docking site for caspase-8 and -10, which cleaves downstream targets, like caspase-3, -6, and -7, subsequently inducing apoptosis. In lung cancer cells, prodigiosin induced apoptosis by decreasing levels of phosphorylated FADD (pFADD) and NF-κB activity . It is noteworthy that FADD is a multifunctional protein that can participate in both apoptotic and non-apoptotic signaling pathways; particularly, phosphorylation of FADD (Ser194) regulates its non-apoptotic activity  (see section “Necroptosis”). Akt (syn. protein kinase B), is an oncoprotein, serine/threonine kinase, with three isoforms (Akt1, Akt2, and Akt3), which play a crucial role in cell survival, proliferation, differentiation, apoptosis, tumorigenesis, and metastasis . Akt, in cooperation with “phosphatidylinositol-3-kinase” (PI3K) and “mechanistic target of rapamycin” (mTOR), are the core-regulators of the PI3K/Akt/mTOR signaling pathway which promotes cell survival by inhibiting apoptosis through the inhibition of proapoptotic Bcl-2 family members (Fig. 1) . The overexpression of Akt is associated with drug-resistance in various cancers, e.g., lung, breast, ovarian, gastric and pancreatic carcinomas thus several strategies have been developed recently to target critical components of the PI3K/Akt/mTOR signaling pathway [53, 54]. In phase I clinical trials, Akt inhibitors such as MK-2206, an allosteric inhibitor of all Akt isoforms, effectively blocked Akt signaling in solid tumors and was well-tolerated . A phase II clinical trial also demonstrated that MK-2206 is a safe agent with a modest activity in Hodgkin lymphoma . Furthermore, polytherapy with MK‑2206 and trastuzumab or lapatinib improved the outcome in some breast cancer patients (Table 2) [52, 56]. In contrast, monotherapy with perifosine displayed limited success in patients with Waldenström’s macroglobulinemia in phase II clinical trial . Other Akt inhibitors are under clinical evaluation; for example, PBI-05204 is in phase I clinical trial for advanced solid tumors, RX-0201 is in phase II clinical trial for RCC and pancreatic cancer, and miltefosine is in phase III clinical trial for breast cancer [57, 58]. However, due to the involvement of the Akt pathway in diverse physiological processes, like glucose metabolism, potential toxic side-effects must be considered . It is noteworthy that the PI3K/Akt/mTOR pathway represents a typical model of redundancy in biological systems, i.e., cancer cells respond to chronic treatment with drugs targeting a single pathway by adopting alternative signaling circuitry, thus escaping drug-induced growth inhibition and death . For instance, despite successful application of Akt inhibitors in kidney and breast cancers, tumors ultimately evaded inhibition of this pathway . Epidermal growth factor receptor (EGFR), a receptor tyrosine kinase, is stimulated by the binding of “epidermal growth factor” (EGF). Subsequently, the Ras/MAPK or the PI3K/Akt/mTOR signaling pathways are activated (see section “Autophagy”) . Deregulation of EGFR activity causes aberrant EGFR signaling, resulting in tumor cell survival, proliferation, invasion, and metastasis in a variety of cancers, e.g., lung, head, and neck, colon, pancreas, and brain cancers [59, 60]. For instance, EGFR activation alters posttranslational modifications of Bad, disrupting apoptosis . EGFR inhibition also induces NF-κB signaling, promoting tumor survival in NSCLC models , providing a rationale for potential combinatorial targeting EGFR and NF-κB to improve patient response . Sine oculis homeobox homolog-1 (Six1), a homeodomain transcription factor , is regulated via the PI3K/Akt/mTOR signaling pathway . During embryogenesis, expression of Six1 in association with the “Eyes absent-2” (Eya2) stimulates proliferation and survival of progenitor cells, but expression is repressed in adult tissues. In several cancers, Six1 is re-expressed leading to reduced levels of apoptosis . Research suggests that allosteric inhibitors, such as N-arylidenebenzohydrazide compounds, are potentially able to inhibit Six1/Eya2 , restoring apoptosis in drug-resistant breast cancer cells . Overall, perturbation of the Six1/Eya2 transcriptional complex or inhibition of the enzymatic activity of Eya2 could be a feasible approach to develop novel anticancer agents . Glycogen synthase kinase-3 beta (GSK3β) is a multifunctional serine/threonine protein kinase which was initially reported as a potential tumor suppressor due to inactivation of GSK3β in many cancer cells. Unexpectedly, inhibition of GSK3β attenuated survival and induced apoptosis in various types of cancer, e.g., NSCLC, pancreatic, colorectal and bladder cancers. Therefore, it probably plays a pro- versus antiapoptotic role which requires further investigation . Heat shock proteins (HSPs), consisting of HSP90, HSP70 and HSP27, are cytoprotective, stress-inducible molecular chaperones naturally expressed after various death stimuli like hyperthermia, oxidative stress, staurosporine, and cytotoxic drugs . Their mechanisms of action involve: (1) catalyzing the proper folding of proteins thus avoiding protein aggregation. (2) inhibiting cell death, particularly apoptosis; for example, HSP70 or HSP90 binds to the apoptotic protease, inhibiting the activation of caspases . Additionally, HSP70 binds to cytochrome-c or blocks the AIF . HSPs are overexpressed in various cancers and associated with tumor cell proliferation, differentiation, invasion, metastasis, and chemotherapy resistance . The inhibition of HSPs is, therefore, emerging as a novel strategy for cancer therapy (see section “Immunotherapy”) (Table 1) . More detailed information can be found in the following review articles [68, 69]. HSP90 is a chaperone for many cancer-associated proteins, e.g., apoptotic mediators (Bcl-2, Apaf-1), cell-cycle regulatory proteins (CDK4, hTERT), and tumor suppressor genes (e.g., p53). Many negative regulators of apoptosis require HSP90 for proper folding, and if HSP90 is inhibited, these negative regulators are rapidly degraded. Thus, targeting HSP90 is of particular interest in the treatment of advanced cancers with multiple oncogenic alterations . To date, several HSP90 inhibitors underwent early phase clinical trials, such as geldanamycin-derivatives (e.g., 17-AAG, 17-DMAG and IPI-504), synthetic inhibitors (e.g., SNX-5422 and CNF-2024) and radicicol-derivatives. However, clinical results thus far are disappointing because of HSP90 inhibitors inherent toxicity and simultaneous triggering upregulation of HSP70 in the tumors . Therefore, a combination of HSP90 and HSP70 inhibitors present a theoretical therapeutic strategy (Table 1) . HSP70 is described as one of the most cytoprotective proteins, blocking all main cell death types: apoptosis, autophagy, and necrosis. Overexpression of HSP70 strongly increases the tumorigenesis and is associated with resistance to chemotherapy . Several potential HSP70 inhibitors (e.g., VER-155008, ADD70, and MAL3-101) have been tested at the preclinical stage over the past few years . HSP27, (syn. HSPβ1), has strong antiapoptotic properties  and the phosphorylation of HSP27 regulates actin dynamics and iron uptake . It has been shown that inhibition of methylglyoxal modification of HSP27 can sensitize tumor cells to drug-induced apoptosis . Furthermore, interferon gamma suppressed basal transcription and promoter activity of HSP27 . Overall, the structural complexity of HSP27 challenges the search for therapeutics that could neutralize its activity. Additionally, due to the importance of HSP27 in preventing neurodegenerative diseases, care must be exercised afore administrating HSP27 inhibitors in cancer therapy . Upon cell detachment from an extracellular matrix, cells undergo a particular type of apoptosis, which is termed “anoikis,” limiting attachment to inappropriate matrices and anchorage-independent cell growth . Anoikis inactivation plays a key role in cancer metastasis. Anoikis-resistance develops through biochemical mechanisms such as oncogene activation, eliciting antiapoptotic/prosurvival signals (e.g., MAPK and the PI3K/Akt/mTOR pathway), overexpression of growth factor receptors and a change in the repertoire of integrins (α5β1,αvβ3, α1β1 and α6β1), allowing detached cells to grow in different tissues . Overall, knowledge on anoikis is still in its infancy, and identifying promising pharmacological targets for antimetastatic cancer therapy in future will require a bettered understanding of all signaling pathways . Necroptosis is a caspase-independent type of cell death induced by the TNF-receptor superfamily and executed by the “receptor-interacting protein kinase-1” (RIPK1), RIPK3, and “mixed lineage kinase domain-like protein” (MLKL) , resulting in reduced ATP levels and “poly (ADP-ribose) polymerase-1” (PARP1) hyperactivation . Morphologically necroptotic cells demonstrate some common features like moderate chromatin condensation, cytoplasmic swelling, and rupture of the plasma membrane . Recently, necroptosis-based cancer therapy, exploiting a distinctive molecular pathway for regulation of necroptosis, has been proposed as an alternative approach to overcome apoptosis-resistance, . For example, necroptotic cells release highly immunogenic “damage-associated molecular patterns” (DAMPs), initiating adaptive immunity. These dying cells can also activate NF-κB to express cytokines, recruiting macrophages . Thus, the unique capability of necroptosis to evoke immune cells at the tumor site may improve the efficacy of checkpoint-blockade during immunotherapy administration . Furthermore, combining checkpoint-blockade and vaccination with necroptotic cells can enhance clinical outcomes . However, in cancers with necroptosis-resistance, this therapy might be less effective [73, 74]. More detailed information can be found in the following review articles [73, 74]. To date, although little is known about negative regulators of necroptosis, the “carboxyl terminus of HSC-70 interacting protein” (CHIP), cFLIP and FADD appear to be potential targets. CHIP is an E3 ligase with tetratricopeptide as a chaperone-binding motif, which regulates several tumor suppressor proteins, e.g., p53, and “phosphatase and tensin homolog” (PTEN), protecting cells from apoptosis. However, the role of CHIP in nonapoptotic cell death signaling is controversial . It has been reported that CHIP negatively regulates necroptosis through ubiquitylation- and lysosome-dependent degradation of RIPK1–RIPK3 necrosome (Table 1) . cFLIP splice variants regulate necroptosis through preventing caspase-8 activation at the DISC. cFLIPS can promote RIPK1/3-dependent necroptosis induction. In contrast, cFLIPL inhibits necroptosis jointly with caspase-8; formation of cFLIPL/caspase-8 heterodimers resulting in localized caspase-8 activity and consequent inactivation of RIPK1 and RIPK3 (complex IIb) . Accordingly, cFLIPL might be considered as a potential target to restore necroptotic cell death. FADD is also implicated in several DR-induced nonapoptotic activities including embryogenesis, cell-cycle progression, cell proliferation, tumorigenesis , and supposedly negatively regulates necroptosis. Most of these nonapoptotic activities are regulated by the levels of pFADD forming the complex IIb (Fig. 1) . Starvation and hypoxic conditions or high temperature activate “autophagy” as an essential mechanism of cell survival, via recycling of intracellular components [59, 78]. Overactivated autophagy can promote cell death, termed “autophagic cell death.” Autophagy is, however, simultaneously a double-edged sword contributing to either tumor cell death or survival [59, 78]. For example, EGFR is a regulator that determines the fate of autophagy (see sections “Apoptosis” and “EGFR”) . Overall, the role of autophagy in development of cancer is controversial and appears to be prosurvival which promotes tumorigenesis/metastasis and allows tumors to escape immunosurveillance . Furthermore, autophagic cell death attenuates apoptosis . The context of autophagy induction is critical to using drugs to inhibit or activate autophagy with the aim of ensuring cancer cells die. Autophagy activators and inhibitors have been broadly used to study autophagy; however, discovering potential therapeutics to modulate autophagy is still a significant challenge and drugs should be selected based on the type and stage of cancer progression . For instance, chloroquine compounds are assumed to diminish autophagy-dependent resistance to chemotherapy ; particularly, hydroxychloroquine inhibits autophagy in cancer cells and restores sensitivity to endoplasmic reticulum pathway inhibitors, such as tamoxifen . In contrast, mTOR inhibitors activate autophagy leading to cell death in cancer [4, 79]. Negative regulators of autophagy, e.g., mTOR, cFLIP, and EGFR are orchestrated to function at multilevel within the autophagy cascade (Figs. 1, 2). Incidentally, even the end-products of autophagic digestion may serve as a negative-feedback regulatory mechanism to preclude prolonged activity [78, 80]. mTOR is a phosphoinositide-3-kinase-related kinase at the crossroads of multiple survival, oncogenic and metabolic pathways which also plays a role as a negative regulator of autophagic signaling pathways. mTOR represses the Atg complex which is essential for the initiation of autophagosome formation [79, 80], leading to tumorigenesis and angiogenesis via the PI3K/Akt/mTOR signaling pathway  (Figs. 1, 2). mTOR inhibitors have been in use since the 1980s; for instance, rapamycin showed a broad anticancer activity. However, its clinical development was impeded by significant inter- and intrapatient variability . Subsequently, rapamycin analogs, namely rapalogs, e.g., temsirolimus, everolimus, and ridaforolimus, were developed with more favorable pharmacokinetic properties (Table 1) . In 2007, temsirolimus (Torisel™) was approved by the FDA for the treatment of advanced RCC; later, in 2009, it was authorized by the European Union for treatment of patients with mantle cell lymphoma [58, 79]. Everolimus, despite metabolic and immune-related side-effects, was also approved by the FDA for some malignancies, e.g., advanced RCC and kidney cancer [58, 81]. Subsequently, third generation compounds, so-called “dual PI3K/mTOR inhibitors” are being preclinically tested due to the potential advantage of simultaneous inhibition of both PI3K and mTOR leading to the strongest inhibition of the whole PI3K/Akt/mTOR pathway and induction of autophagy (Fig. 1) . It is noteworthy that induction of autophagy may represent a mechanism of resistance, protecting cancer cells from mTOR inhibitors . Research suggests triple knockdown of Atg7, Atg5 and Atg3 genes and treatment with hydroxychloroquine overcome the resistance to mTOR inhibitors, leading to induction of apoptosis in mantle cell lymphoma. Thus, these results suggest that counteracting autophagy might represent a potential strategy for sensitizing lymphoma cells to everolimus-based therapy (Table 1) . Recently, it has been shown that activators of “AMP-activated protein kinase” (AMPK) can induce autophagy and apoptosis through inhibition of the mTOR complex. It has also been proposed that activators of the AMPK pathway may be administrated in combination with mTOR-specific inhibitors like rapalogs, to enhance antitumor efficacy . It is noteworthy that activating the AMPK pathway may influence the Warburg effect in cancer cells . For example, activated AMPK negatively regulates the Warburg effect suppressing tumor growth . Therefore, care must be exercised before employing such therapies . EGFR and its downstream targets of the PI3K/Akt/mTOR pathway negatively regulate autophagy. Mechanistically, mTOR binds to Beclin-1 leading to decreased Beclin-1 associated kinase activity and reduced autophagy (Fig. 1) . Anticancer therapeutics that target EGFR include (i) anti-EGFR antibodies, such as trastuzumab that, inhibit ligand binding (see section “Immunotherapy”) , and (ii) “tyrosine kinase inhibitors” (TKIs), particularly erlotinib and gefitinib, which block EGFR intracellular tyrosine kinase activity . TKI therapy, however, restores autophagy and improves the survival of breast and lung cancer patients (Table 1) [59, 60]. To date, several EGFR-TKIs have been approved by FDA for treatment of NSCLC, e.g., afatinib, erlotinib, gefitinib, and osimertinib. More detailed information can be found in the recently published review article . However, small-molecule TKIs have shown a limited clinical advantage in the most of the solid tumors , as the application of EGFR-TKIs play a protective role in some cancer cells . cFLIP inhibits Atg3-mediated autophagy through inhibition of autophagosomal membrane elongation (Fig. 2) . Ferroptosis has been recently described as an iron-dependent, oxidative type of cell death , which is morphologically characterized by the presence of smaller than normal condensed mitochondria, reduction or vanishing of mitochondrial cristae, and outer mitochondrial membrane rupture [10, 86]. Central mediators of ferroptosis are iron metabolism and lipid peroxidation signaling including iron and reactive oxygen species (ROS) accumulation, activation of MAPKs, the release of arachidonic acid mediators, Δψm dissipation, inhibition of system Χc− with decreased cysteine uptake, glutathione (GSH) depletion and increased NADPH oxidation [10, 67]. FDA-approved anticancer therapeutics like sulfasalazine, sorafenib and artesunate can inhibit the growth of cancer cells by induction of ferroptosis in both a Ras-dependent and -independent manner, representing a promising prospect for cancer therapy . Overall, there is the potential of using iron- and ROS-dependent death for the treatment of cancer. Preclinical studies show that SMIs can be valuable anticancer agents to control cancer stem cell populations . SMIs can target nodes in the cellular glutathione antioxidant network; for example, parthenolide and phenylethyl isothiocyanate target the catalytic subunit of glutamate cysteine ligase, glutathione peroxidase, and glutathione; sulfasalazine and erastin target system Xc− . Ferroptosis research, however, is in its infancy and further investigation of the mechanisms involved will be necessary to manage ferroptosis-based therapeutic intervention and challenges. For example, following erastin treatment in HeLa cells the phosphorylation of HSP27 induces ferroptotic resistance through blocking cytoskeleton-mediated iron absorption . Glutathione peroxidase-4 (GPX4) converts reduced GSH to “oxidized glutathione” (GSSG) while reducing lipid hydroperoxides to alcohols or free hydrogen peroxide to water. Knockdown of GPX4 restores ferroptosis in an iron-, MAPK-, and ROS-dependent manner, whereas overexpression of GPX4 leads to ferroptosis resistance (Table 1) [10, 86]. System Xc− is an amino acid antiporter, which imports cystine into the cell in exchange with glutamate, where cystine is reduced to cysteine to then synthesize the antioxidant GSH. Inhibition of system Xc− with sulfasalazine or erastin can trigger ferroptotic cell death in cancer cells [10, 87]. Nuclear factor erythroid-derived 2-like 2 (NFE2L2) is a transcription factor that regulates the expression of antioxidant proteins. NFE2L2 has an anti-ferroptosis role and knockdown of NFE2L2 gene in HCC enhanced erastin- or sorafenib-induced ferroptotic cell death . Iron transport can induce ferroptosis in breast cancer cells following treatment with siramesine or lapatinib  by downregulating and upregulating expression of ferroportin and transferrin, respectively, leading to increased cellular iron (ferroportin releases Fe2+ from cells, and the “transferrin receptor-1” (TfR1) mediates the cellular iron uptake by endocytosing transferrin). Iron catalyzes Fenton reactions and enhances ROS generation resulting in cell death . Typically, any mutated tumor cell is detected and destroyed by the “immunosurveillance” network, consisting of innate (e.g., phagocytes) and adaptive immune systems (e.g., lymphocyte, T and B-cells). In a malignancy state, however, tumors establish an “immunosuppressive” microenvironment to escape immunosurveillance . Modulating the immune system to lessen immunosuppression, and to enhance antitumor immunity is called “immunotherapy” which is being developed to overcome the limitations of conventional cancer therapies such as poor survival rates and recurrence in patients . Hence, understanding immunosuppressive network in tumors is essential for developing effective cancer immunotherapy strategies . To date, among different strategies, antibody-based therapy and vaccination have been administrated for targeting negative regulators of cancer cell deaths. Antibody-based therapy Monoclonal antibodies target tumor-associated antigens, for example, trastuzumab and cetuximab target EGFR2 and EGFR, respectively; evoking cell death by blocking growth and survival pathways. Additionally, the innate immune response can also be triggered through mechanisms such as antibody-dependent cell-mediated cytotoxicity [59, 89, 90]. Vaccination Therapeutic cancer vaccines are administrated to patients in order to eradicate cancer cells while not harming healthy cells by evoking immune responses [89, 91]. Cancer vaccines, which have been thus far developed to target negative regulators of cell death, can be categorized into dendritic cell (DC)-based vaccines (e.g., survivin DC-based vaccine), peptide-based vaccines (e.g., SurVaxM™), and protein-based vaccines (e.g., CIMAvax-EGF™). The EGFR family (e.g., EGFR, EGFR2, EGFR3, and EGFR4) plays a fundamental role in many cancers (see sections “Apoptosis” and “Autophagy”). To date, the following anti-EGFR monoclonal antibodies have been approved by the FDA for clinical treatments . Cetuximab (Erbitux™) is a chimeric antibody, binds to the extracellular domain of EGFR, blocking EGFR-driven signaling, resulting in induction of apoptosis. Cetuximab has been approved for clinical treatment of metastatic NSCLC, metastatic colorectal, and advanced head and neck cancers [93, 94]. Panitumumab (Vectibix™) is a fully humanized antibody with the proposed mechanism of action similar to cetuximab. Panitumumab has gained FDA approval as a single agent for treatment of metastatic colorectal cancer in 2006 [94, 95]. Trastuzumab (Herceptin™), a humanized antibody, targets the extracellular domain of EGFR2 (syn. HER2), inhibiting EGFR2 signal transduction. Trastuzumab is clinically used for the treatment of metastatic breast cancer, gastric and gastro-oesophageal junction carcinomas [94, 96] and has also been studied in polytherapy regimens (Table 2) (see section “Akt”). CIMAvax-EGF™ is an EGF-based vaccine (Table 1) composed of human recombinant EGF conjugated to the P64 protein as a carrier and emulsified in Montanide ISA51 as an adjuvant. The vaccine induces antibodies against self-EGFs, blocking EGF-EGFR interaction. A phase IV clinical trial of CIMAvax-EGF™ was completed for NSLSC, confirming the safety of treatment [97, 98]. Survivin-based vaccine strategies focused primarily on regional epitopes of the survivin splice variants (e.g., survivin-2B and survivin-ΔEx3). Vaccines directed against survivin, target the post-proteasomal processed fragments of molecules located at the cell surface. Subsequently, the immune system recognizes survivin’s processed molecular fragments and generate cytotoxic T cell (CTL) to eliminate tumor cells . To date, several survivin-targeting immunotherapeutic strategies have been developed, and phase I/II clinical trials are still in progress. DC-based vaccines are desirable due to the vast antigen presentation potential of dendritic cells. In an early phase clinical trial, DC vaccines pulsed with apoptotic bodies of cells that overexpressed survivin showed a positive immune response in NSCLC . However, other trials in patients with renal carcinoma and multiple myeloma were not promising . Some survivin peptide-based vaccines are currently under development . For instance, phase I clinical trial with survivin-2B peptide vaccine showed safety and produced CTL immune response in colorectal, pancreatic, breast, oral and urothelial cancers . Another vaccine, SurVaxM™, a multiepitope cryptic peptide survivin-mimic, showed specific CD8+ T cell responses, as well as specific CD4+ T cell stimulation. SurVaxM™ is theoretically advantageous over other survivin-based vaccines due to its capability of simultaneously targeting several survivin variants . A phase I clinical trial demonstrated safety and tolerability of SurVaxM™ for recurrent malignant glioma. Currently, phase II clinical trial is undergoing for glioblastoma (Table 1) . HSP-based vaccines are one of the promising immunotherapeutic strategies . HSP1-CTL vaccine was generated by stimulating T lymphocytes with DCs pulsed with human HSP1 peptide. Preclinical studies showed the modified HSP1-specific CTL could specifically attack myeloma cells . Furthermore, the result of phase II clinical trial of “autologous HSP peptide complex-96 vaccination” was safe and promising for glioblastoma (Table 1) . Biomarkers include proteins (e.g., enzymes or receptors), nucleic acids (e.g., microRNA), antibodies, and peptides, used in oncology for risk assessment, screening, diagnosis, prognosis, prediction of response to treatment, and monitoring of tumor progression . Biomarkers are detected in the circulation (whole blood, serum, and plasma), excretions/secretions (e.g., urine, sputum), or tissue-derived by biopsy . Biomarker profiling, as a core technic for “personalized medicine,” also can categorize the patients based on individuals’ genomes, thus, enabling predicting cancer risk, prescribing a unique and precise treatment strategy, and customizing medical care for individual patients . Overexpression, downregulation or mutation as well as alterations in the expression pattern of proteins, indicating drug-resistance like Bax, Bcl-2, NF-κB, and survivin, can be detected in tissues using immunohistochemistry, ELISA, and cytometric bead-based assays . For instance, expression levels of survivin, which is critical for apoptosis resistance in NSCLC, is assessed using ELISA . Moreover, in oncology drug research programs, companion diagnostic assay measures a specific biomarker or combination of biomarkers to predict whether a patient is likely to benefit from the drug in question . For example, the expression profile of prosurvival Bcl-2 members (e.g., Bcl-2, Bcl-xL, and Mcl-1) can predict pharmacological response to venetoclax in multiple myeloma models . To date, several negative regulators of cell death signaling pathways have been clinically used as biomarkers (Table 1). HSPs Given the strong correlation between HSPs expression profiles and tumor progression, there was an interest in using HSPs as diagnostic biomarkers . Lack of specificity and broad expression of HSPs in several diseases has hampered progress. Nonetheless, their potential application as biomarkers in conjunction with other specific tumor markers can be considered to improve therapeutic strategies, including using HSP inhibitors . HSP70 Mitochondrial HSP70 (mortalin), is involved in cell cycle regulation, cellular senescence, and immortalization pathways . Overexpression of mortalin in colorectal adenocarcinoma is correlated with a poor prognosis. To date, the correlation between HSP70 overexpression with therapeutic resistance, differentiation level and aggressiveness of various types of cancer has been confirmed. For example, HSP70 overexpression was reported in different tumors such as gastric adenocarcinoma, hepatocarcinoma, and oesophageal cancer . HSP27 The expression is associated with poor prognosis in gastric, liver, prostate carcinomas, and osteosarcoma. It is also implicated in drug-resistance in breast cancer and predicts poor response to chemotherapy in leukemia patients . The Bcl-2 family Given the fundamental role of the Bcl-2 family proteins in mediating the apoptotic response to anticancer drugs, there has been an increasing interest in considering them as potential biomarkers to predict treatment response. For instance, “BH3 profiling” technic has been developed for measuring the aggregate state of antiapoptotic Bcl-2 proteins at the mitochondrion thus predicting cellular responses to stimuli . Thus far, BH3 profiling has been successfully used to predict chemotherapeutic sensitivity of lymphoma cell lines and clinical response of acute lymphoblastic leukemia, acute myelogenous leukemia, multiple myeloma and ovarian cancer . Additionally, the Bcl-2 family proteins are a prognostic biomarker , and their overexpression is associated with many cancers, e.g., breast and prostate cancers, enabling use as a predictive biomarker in patients (Table 1) . Survivin Overexpression of survivin is consistently associated with poor clinical outcome, high tumor grade cancers, and recurrence, as expression levels are low in healthy tissues . Survivin gene polymorphism influences tumor aggressiveness and survival of cancer patients thus emerging as a powerful tool to be used in cancer prognosis, diagnosis, and development of anticancer therapies . Detection of survivin in serum and urine is considered for the diagnosis of many cancers such as breast, bladder and lung cancers . XIAP Upregulation of XIAP in tumor cells  has been proposed as an independent prognostic biomarker of breast invasive ductal, urinary and bladder carcinomas . High XIAP expression is also associated with a reduced risk of tumor recurrence and has been suggested as a prognosticator of prostate cancer recurrence . cFLIP Elevated expression of cFLIP is frequently identified in malignant tumors correlating with a poor prognosis  and diagnosis of various malignancies (Table 1) [116, 117]. FADD Overexpression of pFADD has been suggested as a clinical prognostic biomarker (Table 1) , and typically infers poor clinical outcome which is due to the ability of pFADD to stimulate the antiapoptotic actions of NF-κB . CHIP Overexpression of CHIP is a prognosticator in postmenopausal breast cancer patients . It, however, indicates poor prognosis in gallbladder carcinoma . PI3K/Akt/mTOR pathway Predictive protein biomarkers (phosphorylated S6, Akt) and genetic biomarkers (e.g., “phosphoinositide-3-kinase catalytic subunit alpha” (PIK3CA) mutation and PTEN loss of function) are investigated in preclinical studies to identify patients most likely to benefit from inhibitors of the PI3K/Akt/mTOR pathway (see section “mTOR”) . Six1 Overexpression of Six1 is associated with a poor prognosis in several types of cancer, e.g., HCC, ovarian and cervical cancers . Furthermore, it has been suggested to be used as a prognostic biomarker for prostate cancer patients at risk of tumor progression . GPX4 Overexpression of GPX4 has been proposed as a potential biomarker for HCC diagnosis and prognosis . The current methods of cancer diagnosis are based on the histological examinations, obtained by surgical excision, tissue or liquid biopsy. Biomolecules circulating in biological fluids like blood and urine, hold tremendous clinical promises, due to easy access, allowing for rapid, economical and dynamic treatment management . To date, the majority of liquid biopsy research has focused on circulating tumor cells, which are not easy to collect. However, circulating nucleic acids (cell-tumor DNA (ctDNA) and microRNA) attracted more attention recently, as being easier to collect and analyze . Circulating microRNAs, are endogenous, non-coding RNA molecules with 18–24 nucleotide length that post-transcriptionally regulate eukaryotic gene expression. microRNAs also play critical regulatory roles in the pathogenesis of cancer . A list of circulating microRNAs, affecting negative regulators of cancer cell deaths that have potential as biomarkers for targeted therapies is presented in (Table 3). Circulating cell-tumor DNAs are mutated DNA fragments derived from tumors, which can be detected in the cell-free component of whole blood . Investigation of ctDNA has recently increased in oncology because genomic analysis is essential for personalized pharmacotherapy in cancer patients. Tumor-specific genomic alterations can be detected in ctDNA from blood samples. Thus ctDNA analysis can complement biopsies for real-time companion diagnostics [125, 126]. In 2016, FDA approved the first “liquid biopsy” test of EGFR mutations for NSCLC, allowing to identify drug-resistance in patients treated with gefitinib (Table 3) . EGFR immunohistochemistry may also predict the benefit of anti-EGFR monoclonal antibodies (e.g., trastuzumab), sensitivity to chemotherapy, radiotherapy, and molecularly targeted therapies . In addition, detection of EGFR2 gene amplification is a potential biomarker which has been proposed to be used with associate drugs like lapatinib and trastuzumab for treatment of breast cancer [126, 128]. It is crucial that targeted therapies and their associated companion diagnostic biomarkers coevolve. New biomarkers are, therefore, required to determine prognosis, detect metastases, predict response and monitor toxicity to treatment . For example, the assessment of circulating tumor cells has a great potential for novel readily-accessed cheaper biomarkers which help evaluate therapeutic response and provide novel anticancer drugs . The early detection of cancer is essential for effective treatment. To date, conventional immunoassays like ELISA are still the most common immuno-diagnostic technics in practice for detecting biomarkers in serum/urine samples . However, sometimes levels of biomarkers are below the detection limit for ELISA . Therefore, the development of ultrasensitive diagnostic assays is practical to improve patient outcomes. Immuno-PCR technics which combine nucleic acid amplification with an antibody-based assay have been evaluated for the detection of many biomarkers as they significantly improve the detection sensitivity by up to109-fold compared to standard ELISA . Further improvements in multiplex real-time immuno-PCR methods would be of relevance to polytherapies facilitating monitoring patients and occurrences of drug-resistance . Applications of multiplex ultrasensitive diagnostic assay could be applied to simultaneously and rapidly detect biomarkers of apoptotic, necroptotic, ferroptotic and autophagic cell death, such as RIPK1  and Beclin-1  to improve patient outcome. For example, a multiplex immunoassay biochip was developed to determine EGFR, nuclear area, and nuclear-to-cytoplasmic ratio in saliva for detection of malignant/premalignant oral lesions . Furthermore, one new immuno-PCR platform based on the Tus–Ter complex [129, 133, 134] could be instrumental in the development of such multiplex immuno-PCR assays. Recently, the use of target molecules attracted attention in immunotherapy as well so that the immunosuppressive tumor microenvironment can be more effectively targeted. However, the greatest obstacle to developing new immunotherapeutics is the lack of relevant biomarkers . Many patients do not respond to immunotherapy, and severe side-effects exist. There is a growing demand to find new biomarkers to improve the selection of treatment-responsive patients, to help tailor therapy regimens. However, the search for biomarkers is hampered by incomplete knowledge of how immunotherapies modify the immune response to cancer, and how immunoediting contributes to tumor microenvironments and immune systems . Cancer stem cells (CSCs) are a sub-population of cancer cells, responsible for tumorigenesis, drug-resistance, and recurrence of cancers. CSCs share core signaling pathways with normal stem cells; however, CSCs depend on distinct reprogrammed pathways to maintain self-renewal in order to drive tumor growth. Therefore, understanding of the negative regulation of CSCs will provide effective diagnostic, and therapeutic targets for clinical applications . This review did not discuss the negative regulators of CSCs due to the extensiveness of this topic; however, more detailed information can be found in the following review articles [38, 137]. Most of the therapeutic agents, currently available in the market, evoke apoptosis. However, other cell death mechanisms are less explored due to impediments in measuring contributing molecules, but evidence is accumulating that caspase-independent cell death mechanisms like necroptosis also play a significant role in inducing resistance against conventional therapies, supporting a rationale for engaging other modes of cell deaths in targeted therapies . For example, it has been shown that Smac-mimetics can circumvent resistance to apoptosis by triggering necroptotic cell death in pancreatic carcinoma cells . Moreover, the full potential of molecularly targeted therapy has been hindered by the occurrence of drug-resistance, primarily resulting from negative regulators of cell death signaling pathways ; i.e., targeting a single pathway is improbable to be effective in producing durable remissions because of plasticity, redundancy and feedback mechanisms within molecular signaling pathways in tumor cells , e.g., cross-talk between different cell death signaling pathways is a major point to be noted . To overcome drug-resistance in cancer and avoid side-effects caused by high dose single-agent therapy, cell death signaling can be restored more effectively by targeted polytherapies [4, 7, 78]. For instance, following treatment of melanoma cells with bortezomib, antiapoptotic Bcl-2 family proteins (esp. Mcl-1) are upregulated, leading to drug-resistance. Accordingly, the combination of bortezomib with ABT-737 (a Bcl-2 inhibitor) synergistically reduced the activity of Mcl-1, reduced cell viability and induced apoptosis through activation of Bak/Bax in vitro and in vivo . Furthermore, intermittent scheduling is required to avoid treatment-induced toxicity. Serial tumor profiling and the use of parallel co-clinical trials can also help explore mechanisms of resistance and will direct the development of adaptive clinical trial designs to accommodate hypothesis testing for polytherapies . Overall, a deeper understanding of how a given therapeutic modulates cell death signaling pathways is required to design successful novel polytherapies (Table 2) . The progress in personalized medicine may also guide researchers to generate the next wave of innovative targeted therapy; helping to design polytherapies using biomarkers for selected patient populations . Understanding negative regulators of signaling pathways that lead to escape from cell death will help identify potential therapeutic targets, and design prognostic and diagnostic biomarkers. Strategically molecularly targeted therapies are emerging through investigation of apoptotic signaling pathways. However, other modes of cell death (e.g., autophagy, ferroptosis and necroptosis) are less explored, but evidence is accumulating that nonapoptotic modes of cell death also play a significant role in inducing resistance against conventional therapies, necessitating further attention for drug discovery.